So .. here's Kathryn's (much delayed!) 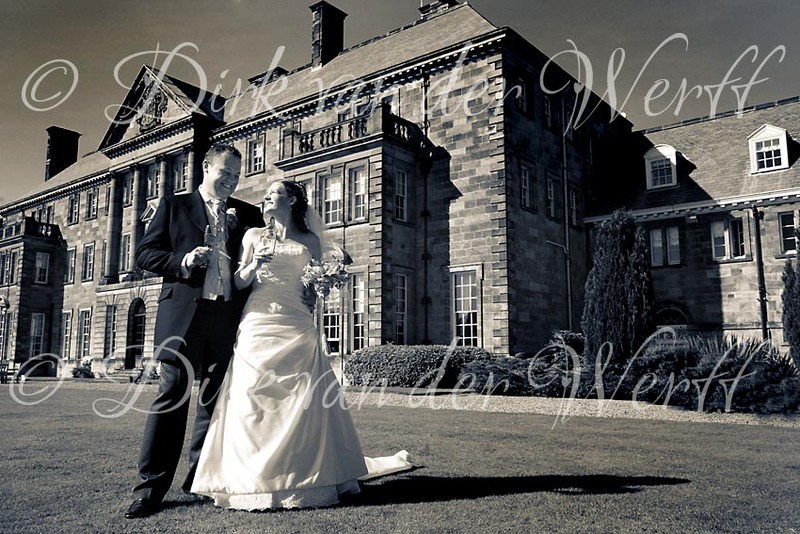 review of my part in her and Gareth's wedding at Crathorne Hall! ".......It’s difficult to truly put into words how much Dirk was part of our big day…really how many other wedding photographers do you know would drive two hours across the country to do a pre-wedding shoot to get to know us… by climbing a mountain in the Lake District with us and his kit? Dirk, I’m sure you remember that day; we had such blustery fun taking you back to the spot in which we got engaged! I think if we hadn’t worked it out beforehand we knew then that we had made the right choice in Dirk as our wedding photographer. After Gareth proposed and I set about taking the reins to organise our wedding, as the groom, one of Gareth’s few tasks was to find a photographer. Our first meeting with Dirk at Crathorne Hall for a coffee was very relaxed and informal and seeing some of the recent wedding images he’d captured made our decision very easy. After nearly three years of being married we still look back and agree Dirk was just fabulous on our wedding day. On the run up to the wedding day Dirk was happy to spend as much time with us as we needed to discuss the photos and manage my general excitement. The day itself just happened, and our family and friends had a fabulous time. The sun shone as you wouldn’t believe for September – a photographer’s worst nightmare so I’m told, but this wasn’t in the least bit reflected in the pictures. Looking back I barely remember Dirk being there, but he was and many of our guests commented that if he hadn’t been harbouring a camera or two they’d never have known he was our photographer. Dirk captured our wonderful day in a storyboard of images, each moment special to us and is a reminder of a day which we both cherish. The hardest decision then was choosing from all of the great pictures for the album and Dirk’s patience as I kept changing my mind because I really was spoilt for choice! The end result a perfect album and a very happy couple. The framed picture of our mountain adventure as a wedding gift was a lovely touch. I now realise how lucky we were when Dirk agreed to be our wedding photographer, thank you. If there is a bride-to-be out there in need of a wedding photographer, I can’t recommend Dirk enough....."